I just want to do a quick shout out that there is still time to enter in the Stampendous December Color Challenge – pink, brown, cream, gold (use any 3 or 4 of those color combo). We are giving away an Amore Frame Perfectly Clear™ Stamp set to a random winner. (sorry US winners only). You don’t have to use a Stampendous image or products to play along, but we sure love it when you do! You have until Tuesday, January 3 at 11:59 PM EST to add your link to the linky tool, and we’ll draw a random winner. You can enter as many times as you’d like. And a quick note about the linky tool below – it’s the exact same collection that is being shared on the Stampendous blog, and some of my teammates’ blogs. You can add your direct link to your project featuring those 3 or 4 colors (pink, brown, cream, gold) here on my blog, or any of the other blogs that are sharing the collection! Can a brown bag be presentable? My countdown for Christmas has started!! I’m in full swing of making gifts for friends and family. In our family, we try to teach our kids that Christmas is a time of giving and take the focus off getting Christmas presents. They do get presents of course – but that’s not the lesson we try to share. Anyhow, back to gift-giving, invariably I always miscalculate how many boxes/packaging I need and I end up having to make my own gift bag. So I’m sharing my quick and easy gift bag made from a simple everyday brown lunch bag. I first made a window in the bag using my Spellbinders die. (slide the die in the bag and run the bag + die through the die cut machine.) With the same shaped die but a larger size, I cut out a piece of acetate (those plastic packaging your craft tools come in) for a clear window and tape the acetate over the window opening. Then I made a frame using the same 2 dies from patterned paper and tape it down. You have a bag with windows to load it up with all your goodies. 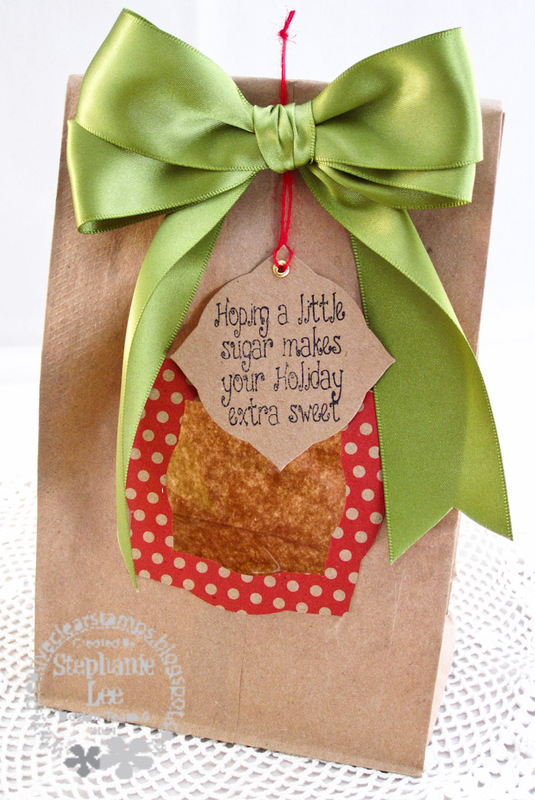 Slap on a tag and ribbon and you have a sweet gift bag on your hands. I used CV0076 Holiday Sentiments to make the tag on the bag. Last but definately not least, this is also my last post with Creative Vision and I have really enjoyed making these wonderful projects with such quality products. Thank you so much Laura for having me. Have a fun fun Christmas everyone! !